The smart folks at Jet Propulsion Laboratory are to be commended for not only thinking up an explanation for the linear gullies on Mars but also for doing a hands-on test of the idea. Perhaps they can say “empirical” after all and not be entirely lost in the Platonic conceits of their minds and maths. Of course, empirical tests aren’t sure things: they remain open to further questions. Only computer simulations can provide Ultimate Truth, as demonstrated with black holes, dark matter, and The Big Bang. And further questions do come readily to mind. 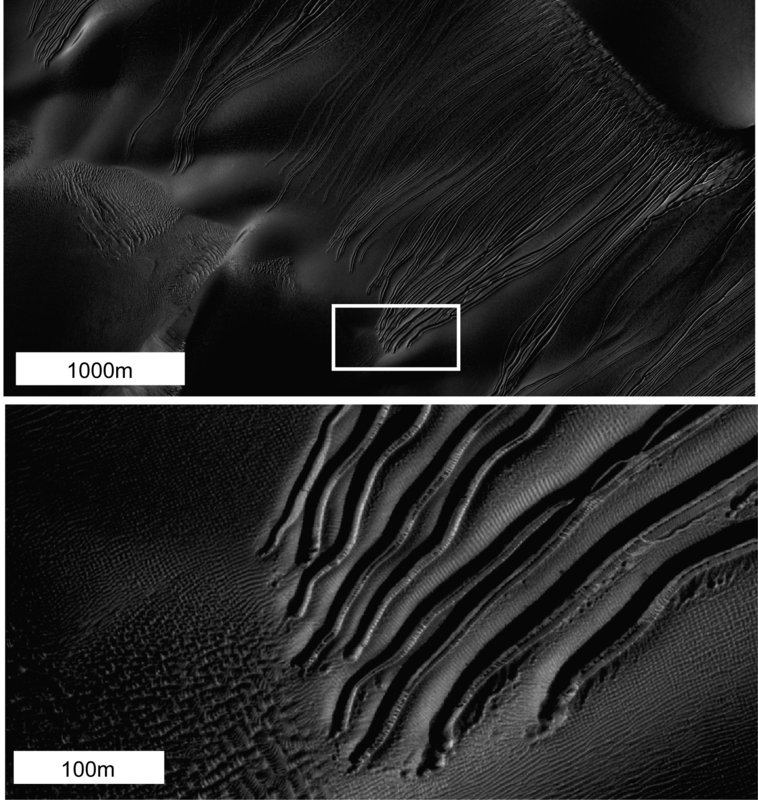 The “sledding” blocks of dry ice did leave regularly spaced ridges along the bottoms of their tracks similar to those shown in the images from Mars. (See the 1:38 mark in the video linked above.) But do the experimental gullies show dikes along each side comparable in relative size and continuity to those on Mars? 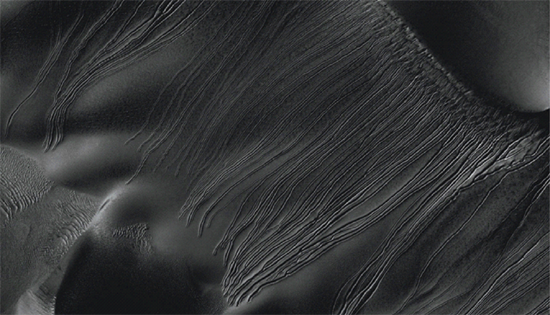 The transverse ridges between the “plowed out” dikes appear to run up and over the dikes, whereas the dry-ice blocks appear to disperse the sand to either side in the “sled wind” produced by the sublimating and expanding carbon dioxide. Did the experimenters do a diligent-search error probe [pdf] for possible alternative explanations, or did they commit the “finder’s fallacy” of adopting the first explanation that was “good enough for government work”? Did they consider the possible effect that temperature difference might have on sublimation rate and thus on “gully excavation” ability? The video of their experiment shows them wearing hats and light clothing under what must be a hot sun shining on what must hot sand. What (if any) differences would show up if they repeated the experiment in a lab after cooling the sandy slope to the temperature of Mars? · The apparent glow at the bottoms of dust devils that leave burned tracks. · The side-by-side dust devils in the “fronts” that precede dust storms, which call up questions about how the thin atmosphere and weak winds can lift that much dust. · The dome and bull’s eye craters that can be duplicated on Earth only with plasma discharges and not impacts. · The start-and-stop intermittent channels with little or no debris in them, and ones that run both up- and down-hill, reminiscent of electric arc excavations. · Spider formations and dendritic ridge structures at the edges of canyon walls that, again, are duplicated in electric-discharge experiments. These essays, of course, urge consideration of electrical explanations in addition to mechanical ones. Congratulations to the experimenters at JPL for practicing one “e” word: empirical. Now they should try to say another one: electricity. *Caution: Do not try this at home. Dry ice is extremely cold. It is also extremely dry.